Tuesday December 5th 1893 weather very much warmer. Fullers were busy all day with the help of a man packing their things. Mother was here in the forenoon. I did not accomplish much in the afternoon. Fullers ate supper and spent the evening with us. 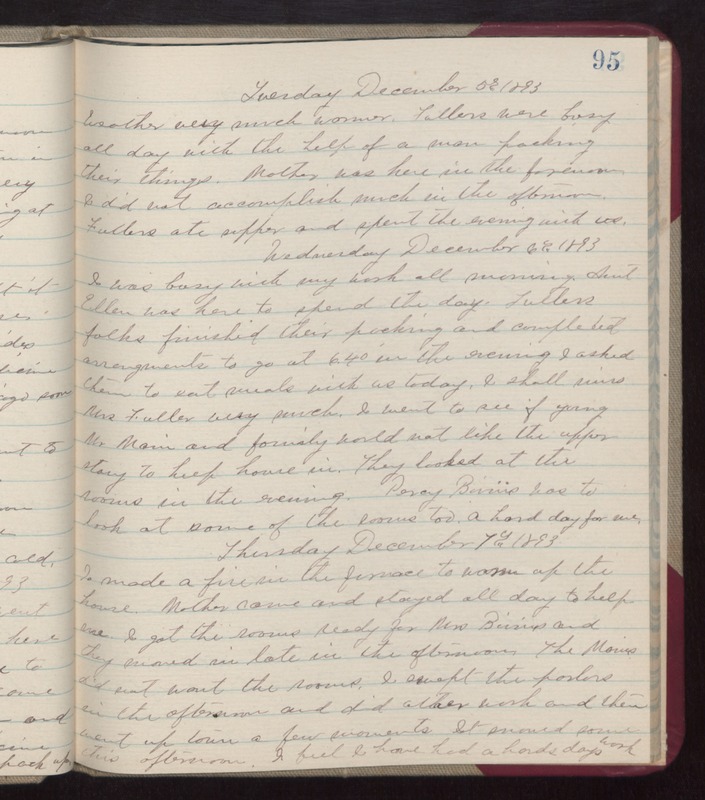 Wednesday December 6th 1893 I was busy with my work all morning. Aunt Ellen was here to spend the day. Fullers folks finished their packing and completed arrangements to go at 6:40 in the evening. I asked them to eat meals with us today. I shall miss Mrs Fuller very much. I went to see if young Mr Main and family would not like the upper story to keep house in. They looked at the rooms in the evening. Percy Bivins was to look at some of the rooms too. a hard day for me. Thursday December 7th 1893 I made a fire in the furnace to warm up the house. Mother came and stayed all day to help me. I got the rooms ready for Mrs Bivins and they moved in late in the afternoon. The Mains did not want the rooms. I swept the parlors in the afternoon and did other work and then went up town a few moments. It snowed some this afternoon. I feel I have had a hard days work.